We can supply new or remanufactured low voltage switchgear with main buss ratings to 6,000 amperes and interrupting ratings to 200,000 amperes. 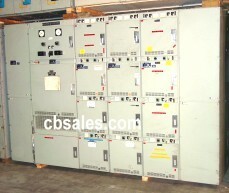 Indoor or outdoor switchgear available. We are a General Electric OEM for new switchgear. Same day delivery with transformers available.